According to media reports Indian showbiz celebrities nowadays remember the Pakistani artists who worked in India. Some of them say that they had great time with certain Pakistani celebrities and wish to repeat this experience again. They also admire them for their good performance.An example of the above fact is the case of Indian actress Sonam Kapoor who worked in an Indian film ‘Khoobsurat’ and performed opposite to Fawad Khan, the Pakistani actor. 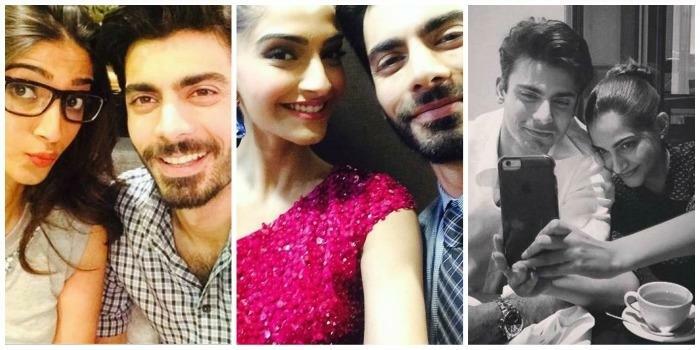 Now she has admired Fawad Khan saying him a good actor and wished to work with him again. The film remained successful like other several films of this actor and actress. Sonam is one of the most busy actress of the Indian film industry. Her full name is Sonam Kapoor Ahuja and she enjoys the reputation of a good actress. She was born on 9 June 1985. Her father and mother too were well known figures of the Indian film industry. Sonam studied at Singapore in a college where subjects of showbiz were taught. She, in addition to her other education, learned there about theater and arts. The other education were the subjects of economics and political science. But she got education of showbiz related subjects with great interest and then made this field her permanent and regular career. She also worked as assistant director to Sanjay Leela Bhansali. Then acted in his drama Saawariya and got Filmfare Award for her good performance. Then she worked in film ‘Khoobsurat’ and performed leading role opposite to Fawad Khan. Fawad too is a very successful actor and according to several indian celebrities he is bigger artist than some Indian stars.The actress, on the basis of her performance in this film won Filmfare Award for Best Actress. She continued her journey of progress and then won another honour with the prestigious, National Film Award.Sonam also enjoys a very good reputation of being one of the most fashionable celebrities. She had been included in Forbes India’s Celebrity 100 list on the basis of her social reputation..
She has been married to a businessman Anand Ahuja. having a good fame as an outspoken person.Sonam has a background of showbiz. Her several relatives including her cousin Ranveer Singh are active in film industry. Her father Anil kapoor and grand father too, are well known names of the industry. The actress was initially ambitious of becoming a script writer or a director, which means she did not want to be an actress. She expressed this ambition to Rani Mukarji, actress and a family friend who were working for a film in Singapore. Accordingly she found work as assistant director to the director Sanjay Leela. Now Sonam is a renowned and award winning actress of the Indian film industry………………………………………………………………………………………..